Leomie Anderson is a lot of cool things. She's the London girl with more sneakers than we've had hot dinners. She's a model who can be found on the cover of i-D as easily as you'll spot her on the Victoria's Secret Fashion Show runway. She's no stranger to the catwalks of Vivienne Westwood, Jeremy Scott and Tommy Hilfiger, but the high street loves her too: Anderson was cherry-picked for Rihanna's River Island show in 2013 and has taken up the prestigious spot as a Topshop campaign girl. 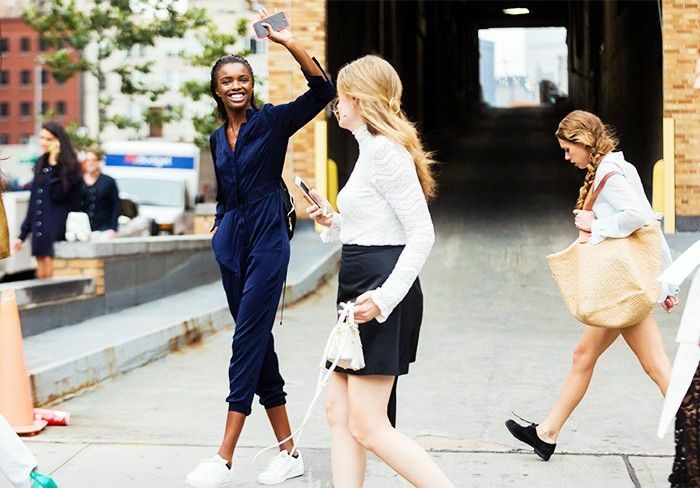 Anderson getting street style snapped at New York Fashion Week. This busy 23-year-old glamorously splits her time between her home city and New York and somehow finds time to uphold a seriously great fashion blog, Cracked China Cup, where she shares her top new buys as well as motivational thought pieces plus honest and insightful behind-the-scenes snaps and information. All that and she's heaps of fun too. So we're pretty darn excited to have her on board as a guest columnist, bringing you an exclusive story every month—from her latest insights into the world of modelling, her style obsessions, blogging tips and more. First up—check out her spring sneaker edit here. Then come back every month to see her latest piece! Leomie Anderson is signed to Premier Model Management.